You will never lose track of those important dates ever again ! With Personal Organizer you will never lose track of those important dates ever again. You can also describe your day using the password protected journal feature to archive your precious memories forever. There are three different view modes; Monthly, Weekly and Daily. There are three different view modes; Monthly, Weekly and Daily. They all display the reminders that have been entered using Daily mode. Daily mode can also be used to write in your journal and set reminders for different times of the day. 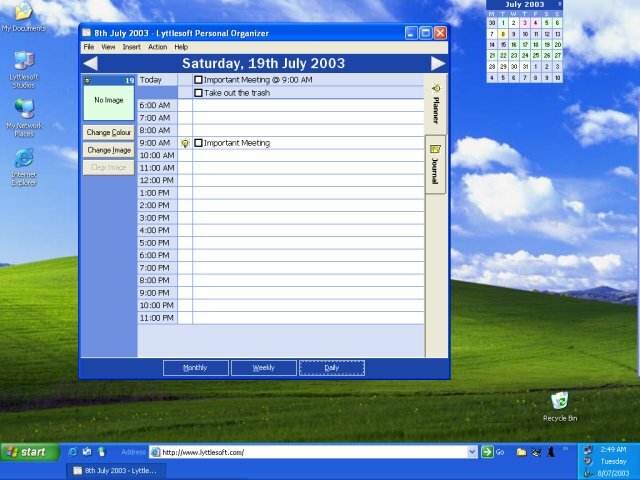 Desktop Calendar mode, which places a small calendar on your desktop. And for those who don't like to be cluttered by programs in the taskbar there is an option to minimise it to the System Tray (next to the clock at the lower right of your screen).